An older sci-fi movie that I really enjoy is a 1997 movie called “Contact.” As the movie begins, the audience sees a girl named Eleanor learning how to use a ham radio. Nicknamed “Sparks” by her father, she has reached a man in Florida, and is excited that her radio lets her speak with someone so far away. In a later scene she asks her father if she can call her deceased mother on the radio. He responds sadly that no antenna is big enough. As the movie progresses, the audience learns that Sparks’ beloved father dies of a heart attack when she is nine years old. She loses the man who meant the world to her. In a poignant scene, while family and friends are still at the house following the funeral, Sparks sits before her radio desperately trying to reach her father. With tears in her eyes, she calls his name into the microphone over and over, searching for her father the only way she knows how. Her receiver, of course, is silent. Many of us here this morning for All Saints’ Day know something of what Sparks was going through. We are here today to remember those we love who have been taken from us by death. Our loved ones may have died recently so the grief we feel may be fresh. Or, perhaps it has been some time since that loss and the pain is not as sharp, but still the grief hurts. We share the longing that Sparks felt sitting at her radio. Where exactly are our loved ones? What is their existence like? If we turn to this strange sounding Bible text in chapter 7 of Revelation, we get a vision of what life is like after death. This is not a precise, “just-the-facts” answer. This reading is part of a vision. It gives us the language of poetry. The author, John, tells us in chapter 4 that he has seen past a door into heaven. As powerful as that imagery is, it is still the language of a vision, not a first-hand report. Even in this blurry, symbolic language, however, we can piece together some affirmations about life in the resurrection. John gets a peek beyond the creation we live in. With the antenna of a vision, he sees things our senses cannot tell us. Originally, John’s vision was a call to courage and endurance in the face of persecution. At the time of his writing, some Christians had been killed outright, and others had suffered harassment, and others had been ostracized – meaning they had been excluded or disowned by family and friends – all on account of their faith. And so John writes down this vision to help Christians see the hope that awaits them on the other side of this troubled life. As John speaks to inspire troubled Christians in his day, he begins to speak to our concerns this day as well. Last week, we talked about waiting, the faith to patiently wait on God, trusting in God promises. Now, this week, we get a glimpse of what life will be like when our wait is over. These are the Christians who have died and have been resurrected. This is not all that John will see in this vision. Later in his vision he will see a city paved with gold; he will see the final defeat of evil; he will see a new heaven and a new earth. But here, he sees a great multitude standing before the throne of God. This multitude is international, multi-ethnic, and multi-lingual. The barriers that divide people on earth have been torn down in the resurrection. We will worship side-by-side and hand-in-hand with people from all countries, of all different languages. Fear and distrust will melt away, and we will embrace each other as brother and sister. The resurrection will be a time of true community and genuine fellowship. This heartfelt worship of the multitude is a picture of closeness to God that goes beyond even our deepest experiences of God’s presence in this life. 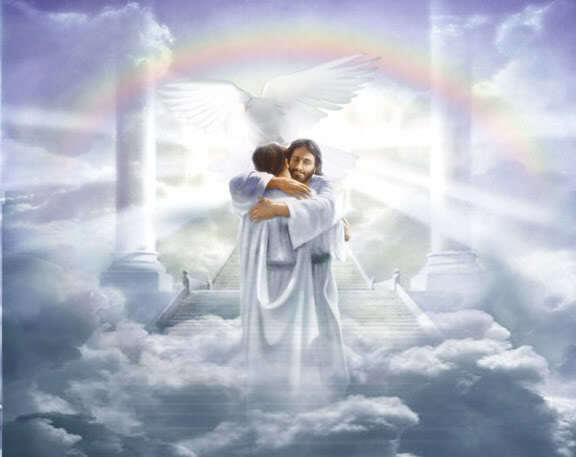 Later in the book of Revelation, John will describe this closeness even more clearly when he says in the 21st chapter of Revelation, “The home of God is among mortals. He will dwell with them; they will be his people, and God himself will be with them.” (Revelation 21:3). When we worship now, we often are distracted, or our responses are mechanical. We are not always into it. John assures us that in the resurrection, our worship will be spontaneous and genuine. We will be fully engaged in our praise of God. There will be a great multitude before the throne of God. And then there is more. The last two verses of our reading holds the tenderest promise of all. These verses promise the healing of our bodies, minds, and souls. We read, “They will hunger no more, and thirst no more.” (7:16) In the resurrection, our physical bodies will no longer be a burden. Our bodies are part of God’s good creation, but our bodies are weak and needy. Our hungers sometimes seem to control us. In the resurrection, we will be free from this control. We will receive resurrection bodies that are not weak or needy. Then we read the promise that “The sun will not strike them, nor any scorching heat.” (7:16) The healing of the physical world will extend even to the realm of nature. Nature is one of God’s greatest gifts, but nature can also be destructive and dangerous. According to the creation account in the Bible, the sun was part of God’s good creation. The sun is good and life giving, but it is also harsh and withering. Who of us has not at one time or another been oppressed by the sun’s heat? It saps our strength, can make us ill, and can even kill us. In the resurrection, people and nature will live in harmony. We will experience God’s creation as the gift it was meant to be. And there is more. Just as our bodies will be healed, so will our emotions, pain, and grief. We read, in verse 17, “For the Lamb at the center of the throne will be their shepherd, and he will guide them to springs of the water of life, and God will wipe away ever tear from their eyes.” Life is full of heartaches. The emotion we share today is grief. Some of us feel the sting of the death of a loved one decades later, the pain hardly diminished by the passing of time. Sometimes anger and grief threaten to overwhelm us. Trying to keep our emotions under control takes enormous energy. John promises that the lamb, meaning Jesus, will guide us to the water of life. We will drink deeply. We will find complete healing. And God will reach out and wipe the tears from our eyes. What peace that gives us to know that in the resurrection, our loved ones have been healed of both their physical illness and pain, and their emotional hurts. There’s one more thing to note. John’s mentions those who have been killed for their faith. When asked, “Who are these, robed in white?” The answer comes, “These are they who have come out of the great ordeal.” We may not experience the same suffering as those who have been killed for their faith, but we do experience life as difficult, painful, limiting, lonely. The word translated as “ordeal” in verse 14 originally meant to squeeze or be under pressure. That could describe part of all of our lives. In a sense, life is a great ordeal. Certainly, we experience many joys in life, but life can also be frustrating, painful, and even cruel. We are not given answers to our questions of why life is this way. We are assured, however, that beyond this life, God will restore, recreate, and redeem. So, let us take heart. We have no antenna to contact those we have lost. Nevertheless, we can comfort ourselves with John’s vision. The resurrection is an experience of true fellowship, of the joyous presence of God, of the healing of body and mind and soul, and of reconciliation with the rest of God’s creation. We may still be in grief this day, yet we affirm a victory beyond grief. We place our loved ones in God’s hands, and entrust them to God’s keeping for all of eternity.